"My Favorite Things" : the 41st John Coltrane Memorial Concert (JCMC); a special holiday celebration, honoring two master JCMC alumni, Bill Pierce & Stan Strickland, and featuring the 14-piece JCMC Ensemble, with host Eric Jackson. JCMC composite photo of Strickland (l) & Pierce (r); credit Bruce T. Hamilton. BOSTON - Nov. 6, 2018 - PRLog -- "My Favorite Things" : a special holiday celebration; the 41st John Coltrane Memorial Concert (JCMC) presented by the Friends of JCMC, Inc. Saturday December 15, 2018, 7:30 pm. Tickets in advance: premium reserved $35, general reserved $30, general reserved (student & senior) $25. [A $3/tix service charge applies to all purchases; an additional $5/tix on day of concert for walk-up sales.] Blackman Auditorium, Northeastern University, 360 Huntington Avenue, Boston, MA 02115. The Friends of John Coltrane Memorial Concert, Inc. (fJCMC), in collaboration with Northeastern University's Office of Student Affairs and the College of Social Sciences & Humanities, presents "My Favorite Things" celebrating the holiday spirit Coltrane-style, bestowing musical good will to all people. This year's holiday concert will also honor two master JCMC alumni, Bill Pierce and Stan Strickland, both of whom have made indelible musical contributions to Boston and well beyond. "My Favorite Things" is a tribute to these two musicians, planned as an evening of joyous celebration, as well as reflection. For tickets: mytickets.northeastern.edu, 617-373-4700; further information: www.friendsofjcmc.org, 617-671-0789. 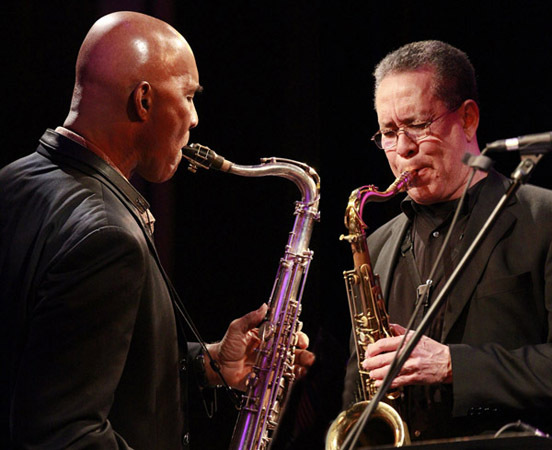 This 41st John Coltrane Memorial Concert features a 14-piece JCMC Ensemble under the musical direction of Dr. Carl Atkins, who has created a performance repertoire that will re-animate Coltrane's compositions, legacy, and philosophy. The concert includes the evening's theme "My Favorite Things," along with such masterpieces as "Greensleeves" (arranged by Leonard Brown and Emmett Price), "Afro Blue" (featuring Stan Strickland and arranged by Atkins), "Like Sonny" by Coltrane (featuring Bill Pierce), among other compositions composed or performed by 'Trane. These Coltrane works will be presented in new arrangements showcasing the 2018 JCMC Ensemble's great musicianship, prowess and flexibility. This year's ensemble, many who have made multiple annual JCMC appearances, will feature Carl Atkins (alto & soprano sax), Tyler Bonilla (trombone), Leonard Brown (soprano & tenor sax), Billy Buss (trumpet), Laszlo Gardony (piano), Yoron Israel (drums), Charles Lewis (trumpet), John Lockwood (bass), Bill Lowe (bass trombone & tuba), Dorsey Minns (trombone), Michael Peipman (trumpet), Bill Pierce (soprano & tenor sax), Stan Strickland (soprano & tenor sax, bass clarinet, flutes, vocals), and Bobby Tynes (alto & tenor sax and flute). They will be joined by host Eric Jackson. Recognized as one of the world's greatest saxophonists, Bill Pierce has created a legacy that is second to none. He has played with such greats as Stevie Wonder, Art Blakey, Tony Williams and Kevin Eubanks. Pierce has appeared on over 80 recordings and for over a quarter of a century, he served as the head of woodwinds at Berklee College of Music, where his legacy as a teacher and mentor is legendary. He recently retired in 2017 and was named emeritus chair of woodwinds. Pierce has been a consistent contributor to the JCMC over the years. His unique, powerful and robust sound has been featured many times and his solos have always been highlights of the performances. Stan Strickland is recognized as one of the greatest artists of our times. He is a master musician, performing on various reeds and woodwinds and vocals in multiple formats for over five decades. Strickland is also an accomplished dancer and actor, having performed and collaborated with choreographers including Alvin Ailey, José Limón and Bill T. Jones and appearing at the Vineyard Playhouse Productions and the Sundance Film Festival. From the first JCMC in 1977 through today, Strickland has been performed on every concert. With all his unique and full sound on reeds, woodwinds and vocals, his spirit has been essential in establishing the outstanding legacy of the JCMC. He has contributed some of the most memorable arrangements and performances in the JCMC history, all exhibiting a deep understanding of Coltrane's music and the ability to recreate and express it in innovative and captivating approaches and formats. Eric Jackson is an internationally recognized jazz radio personality and active promoter of jazz music throughout New England and across the country. WGBH recently celebrated Jackson's 40 years as the "dean of jazz radio in Boston." John Coltrane Memorial Concert originated in 1977, at the Friends of Great Black Music Loft near Boston's Chinatown area, to honor the 10th anniversary of Coltrane's death. Further information on this year's concert, as well as a detailed history of the JCMC, can be found at www.friendsofjcmc.org. : Friends of John Coltrane Memorial Concert, Inc.